You Have Lowered Length of Stay. Congratulations. You’re Fired. For several decades, providers working within hospitals have had incentives to reduce stay durations and keep patient flow tip-top. DRG-based and capitated payments expedited that shift. Accompanying the change, physicians became more aware of the potential repercussions of sicker and quicker discharges. They began to monitor their care and as best as possible, use what measures they could ascertain as a proxy for quality (readmissions and hospital acquired conditions). 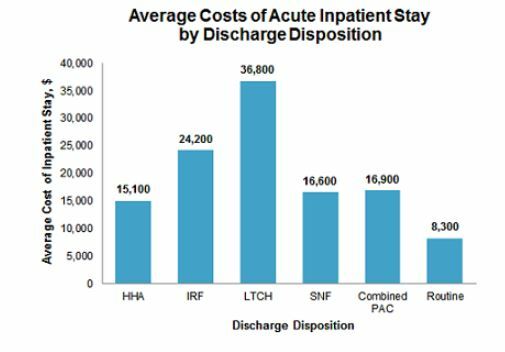 Providers balanced the harms of a continued stay over the benefits of added days, not to mention the need for cost savings. However, the narrow focus on the hospital stay, the first three to seven days of illness, distracted us from the out weeks after discharge. With the acceleration of inpatient episodes, we cast patients to post-acute settings unprepared for the hardship they would face. By the latter, I mean, frailty risk, more reliance on others for help, and a greater need for skilled support. Moreover, the feedback loop and chain of communication between the acute and post-acute environments did not mature commensurate with the faster pace of hospital flow. I recognize this because of the cognitive dissonance providers now experience due to the mixed messages delivered by hospital leaders. On the one hand, the DRG driven system we have binds the hospital bottom line—and that is not going away. On the other, we are paying more attention to excessive costs in post-acute settings, i.e., subacute facilities when home health will do, more intense acute rehabilitation rather than the subacute route. Making determinations as to what is proper and who will be safe versus not, whether families can provide adequate agency and backing, and whether we can avail community services take time. Sicker and quicker, mindful of short-term outcomes, worked when we had post-discharge blinders on. As we remove them, and payment incentives change to cover broader intervals of time, we have to adapt. And that means leadership must realize the practices that held hospitals in sound financial stead in years past are heading toward extinction–or at best, falling out of favor. What follows is a graph and table storyboard with links and comments to help spark conversations between parties on all sides within the post-acute care chain. I will suggest a practical first step when I conclude. 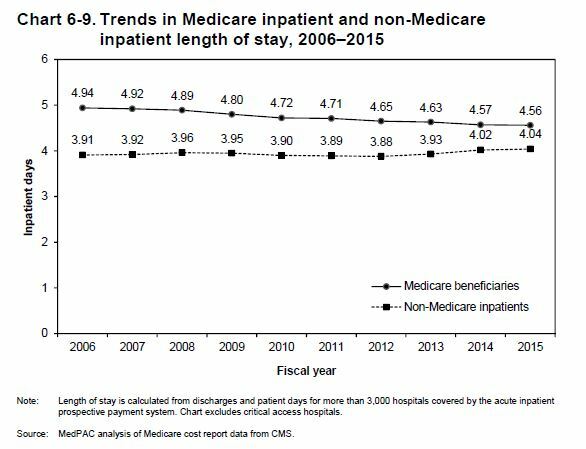 However, in exchange for that flattening, we are using post-acute services at an expanding rate–both out of need, and as a salve. It is safer to oversee and reassure with skilled benefits than to chance a solo trip home. 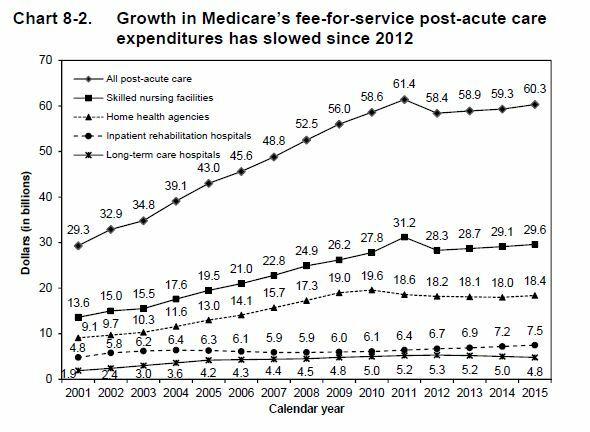 If you compare the costs of routine hospital care with the added expense of post-acute care AND multiply that times an aging, dependent population, you add billions of dollars to the recovery tab—some necessary and certainly some not. A SNF stay doubles the cost of an episode. Again, we have squeezed the LOS sponge to the limit. 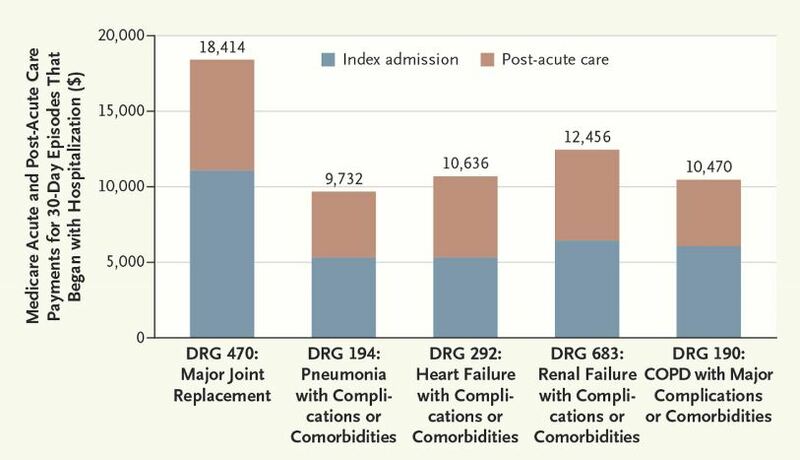 Acute care utilization appears the same regardless of the geographic belt you reside in. 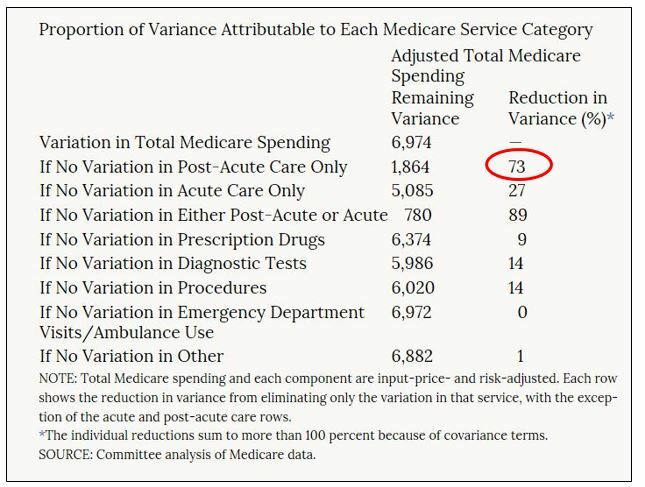 In fact, when you look at care cost variations between hospital referral regions and how each perform over an episode of care (hospital to home) the difference is all post-acute. Seventy-three percent worth! Witness the costs of an episode. We see the world through hospital walls only. Until now, the red you saw below was an expense you conjectured as a paper cut. It’s actually a full on fiscal DRG flesh wound. But our payment scheme lags the message—and payers and administrators have put inpatient providers in an uncomfortable position. Once more, cognitive dissonance. Discharge the patient ASAP while simultaneously transitioning the patient to a post-acute world, not quite A-game specced, creates uncertainty and risk. How do you ensure, then, a smooth trip home and lower the cost of care through better outcomes? A better result may require an extra half or full day to get it right the first time. And that is not something folks upstream from the bedside understand. Not yet. Hospitals are now being held partly accountable for Medicare patients’ care after discharge, as a result of regulations and incentives secondary to the Affordable Care Act. CMS will continue to move in this direction as will commercial payers. But because the payment system has not crossed a tipping point, hospitals do not yet have enough at stake to break from their traditional acute stay mindset (read: get your LOS down!). So we remain in limbo under ambiguous rules. We have no infrastructure in a position to assist us to put patients in the right place. Will a patient thrive at home with a boost from home visits and PT or will they need a SNF? Well, it costs a helluva lot to find out and right now we are spinning a roulette wheel. Predictive analytical tools do exist, but based on the evidence available at present, I cannot say whether number crunching bests common sense and a few obtainable EMR and staff assessed measures. And even if we had an answer, the work flow to make things happen is half-formed, even within systems which have been at this a while. We also don’t know baseline PAC utilization and how often staff (or ourselves) opt to send patients for services. For Medicare, it’s over half the time. Seeing as this is the next hurdle on the inefficiency frontier—and Hospital Medicine Departments will be overseeing PAC use in some manner, as a start, we need to know our referral patterns. If we engage in a penny-wise, pound-foolish approach to hospital throughput, having some awareness of PAC use is a compelling start. The answer? At a minimum, place SNF referral rates on physician or group dashboards—not because we know how to interpret them, but because our insights now are so weak. We need the basics. For example, what is a typical rate of PAC use for equally situated providers within an institution or region? We. Have. No. Idea. These figures do not certify as quality measures—not by a longshot, but they are a beginning, and the trends we glean can lead to more critical decision-making after we obtain a baseline. We began our scrutiny of readmit rates, DRG specific measures, and LOS the same way. Throw it out there. Study. Discuss. I am anxious to know where we are at in a year. 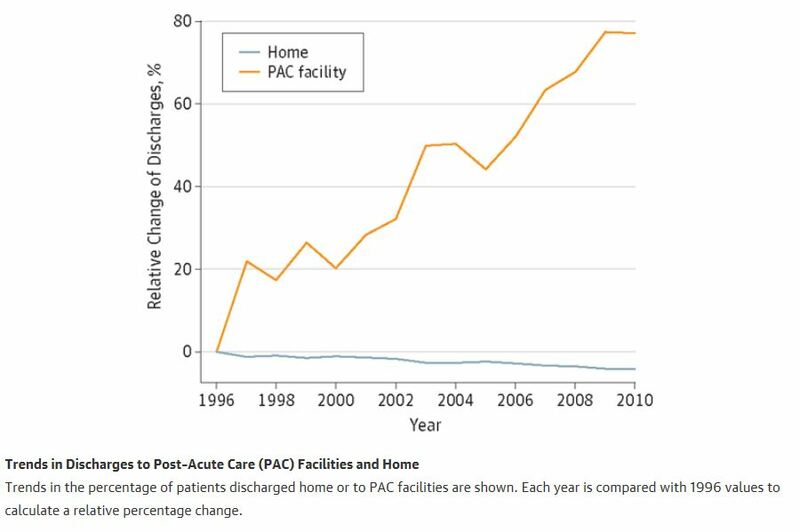 Care transition awareness must improve, and PAC insights must also arise from the clinical side. We have a dearth of experience at the bed level, and we must establish inroads into the full continuum of care to ably respond to future calls. Home-to-home time will be a measure we will hear a lot more of—and if your loved one was sick that is the one you would oblige yourself too. Over the course of illness, that’s the only one that matters. Wow. I never knew about this. In our hospital out here in Central Washington, we get a lot of pressure from Case Management to send the borderline discharges to SNFs. This often adds to length of stay as there may a day or two before the patient gets a bed. Home Health is at least a 2-4 day wait for intake so a patient sent home has that much time without services unless they have strong family support. It’s going to get interesting as we move forward. As an internal medicine resident physician in Columbus, OH I can certainly attest to two major points in this post: 1) physician (and trainee) understanding & education about post-acute care is lacking and 2) the discharge planning to care facilities often prolongs hospital stay. In our IM program we stress coordinating with case management and planning discharge as you are admitting the patient. Our market in central Ohio will need an increase in post acute beds to sustain patient throughput, reduce costs and reduce complications. Very relevant post. 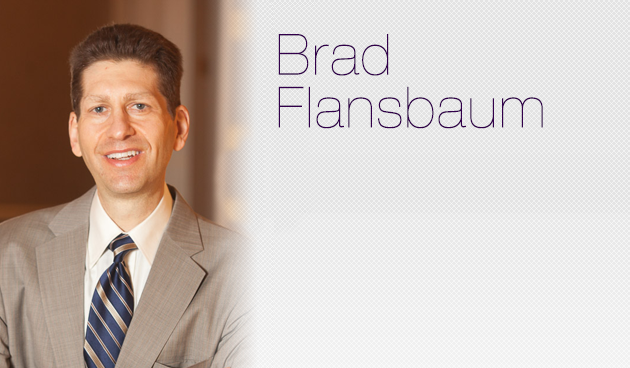 Bradley Flansbaum, DO, MPH, MHM works for Geisinger Health System in Danville, PA in both the divisions of hospital medicine and population health. 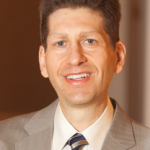 He began working as a hospitalist in 1996, at the inception of the hospital medicine movement. He is a founding member of the Society of Hospital Medicine and served as a board member and officer. He speaks nationally in promoting hospital medicine and has presented at many statewide meetings and conferences. He is also actively involved in house staff education. Currently, he serves on the SHM Public Policy Committee and has an interest in payment policy, healthcare market competition, health disparities, cost-effectiveness analysis, and pain and palliative care. He is SHM’s delegate for the AMA House of Delegates. Dr. Flansbaum received his undergraduate degree from Union College in Schenectady, NY and attended medical school at the New York College of Osteopathic Medicine. He completed his residency and chief residency in Internal Medicine at Long Island Jewish Medical Center in New York. He received his M.P.H. in Health Policy and Management at Columbia University. He is a political junky, and loves to cook, stay fit, read non-fiction, listen to many genres of music, and is a resident of Danville, PA.